Practice Machine Tools and Machining questions and answers for interviews, campus placements, online tests, aptitude tests, quizzes and competitive exams. This set of Machine Tools and Machining Quiz focuses on “Lathe : Calculation of Change Gears”. 1. In simple gear, the intermediate gear has no effect on the ratio between the driver and the driven. Explanation: This is true. The intermediate gear has no effect on the ratio between the driver and the driven, but merely acts as a connection between the two and serves to keep the rotation of the driver and driven in the same direction. Explanation: The gear connection on a lathe may be simple or compound depends upon the requirement. It is versatile. Explanation: The gear on the stud shaft act as a driver. It can be considered as spindle gear as usually it runs at the same spindle speed. 4. Which of the following is also known as Norton gearbox? Explanation: Quick change type of gearbox is also known as Norton gearbox. It covers all the ratio of screw cutting and feed rate likely to be wanted. 5. In Norton gearbox, gear changing is effected by the movement of_____ levers. Explanation: Gear changing is affected by the movements of two levers as well as a sliding gear. This eliminates the need to remove and change the gears as in the standard change gearbox. 6. Teeth on driven gear / teeth on driver gear =_______ T.P.I on lead screw=a, T.P.I. on work piece=b. Explanation: (b/a) – This is the suitable ratio for threads where T.P.I on lead screw=a, T.P.I. on work piece=b. If the units of workpiece and leadscrew threads are different, in that case the gears are calculated as follows: 1 inch = 25.4 mm. 7. Driver gear/driven gear =______ pitch of work piece threads=a, pitch of lead screw =b. Explanation: It is the suitable ratio. In British it will be equal to (a/b)*(5/127). 8. Lead screw pitch=6mm, work piece pitch=1mm. Find change gears. Explanation: Change gear=work piece pitch/lead screw pitch. From this formula, we can easily get 1/6 as a answer. 9. Change gear=2, lead screw pitch = 8. Find work piece pitch. 10. In a compound train, the stud carriers______ gears. Explanation: The stud carriers two gears. The gear on the stud shaft act as a driver. 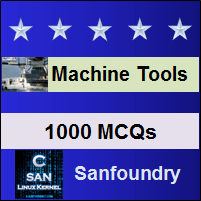 Sanfoundry Global Education & Learning Series – Machine Tools and Machining. To practice all areas of Machine Tools and Machining for quizzes, here is complete set of 1000+ Multiple Choice Questions and Answers.